In a crystal, structural defects such as dislocations or twins are well defined and largely determine the mechanical and other properties. These defects can be easily identified as the broken long-range atomic order. However, the lack of a periodic microstructure makes the searching of similar structural defects a difficult task in amorphous materials. Recent studies found that amorphous materials are intrinsically spatially and temporally heterogeneous, which implies the possibility to identify the dynamic defect in a glass. Metallic glass (MG) with many unique properties is considered as a good model material for its relative simple structure. In the last few years, flow units as dynamic defects were observed and intensively studied in MG systems. A theoretical perspective of flow units was also developed, which not only successfully explains many important experimental phenomena, but also offers the guideline to optimize properties of glasses. 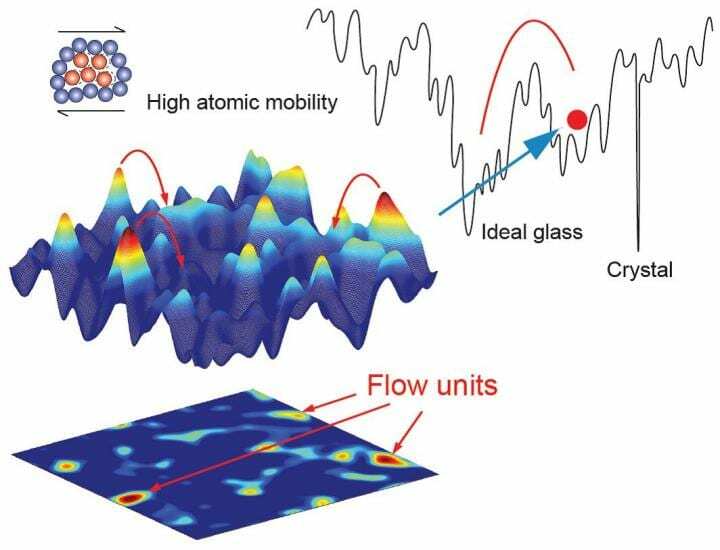 In a new review article published in the Beijing-based National Science Review, scientists at the Institute of Physics, Chinese Academy of Sciences, Beijing, China present the latest advances in the study of flow units which behaves as dynamic defects in metallic glassy materials. Co-authors Zheng Wang and Wei-Hua Wang summarized the characteristics, activation and evolution processes of flow units as well as their correlation with mechanical properties including plasticity, strength, fracture, and dynamic relaxation. These scientists likewise outline applications of this flow unit perspective and some challenges. "We show that flow units that are similar to the structural defects such as dislocations, are crucial in the optimization and design of metallic glassy materials via the thermal, mechanical and high pressure tailoring of these units." they state. "It took more than half a century to finally identify the dislocations in a crystals, which have a much simpler configuration compared to glass. "History doesn't repeat itself, but it often rhymes" said by Mark Twain. The discovery of dynamic defects in glasses has followed a similar track to the identification of dislocations in crystals, and now we at the precipice of final answers to a longstanding questions."